After learning the excessively long name of this great new watch from Audemars Piguet, I began to wonder what Arnold might sound like pronouncing it. The gUBERnator is back in public life now, but his time as California governor never stopped his passion for watches. I heard that being Governor cost him $200 million. I wonder what part of that went to his watch budget. While Arnold doesn’t only wear Audemars Piguet, he has a deep place in his heart for the brand, and has worked with them for a long time. 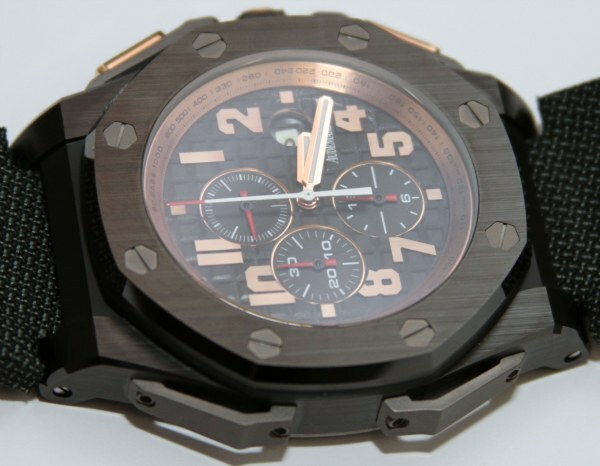 Audemars Piguet and Arnold Schwarzenegger don’t have an official relationship, but AP has made a few limited edition watches for him, including the popular T3 and End of Days watches. Both sold out rather quick. But those two watches don’t wholly define that Austrio-Swiss love affair. 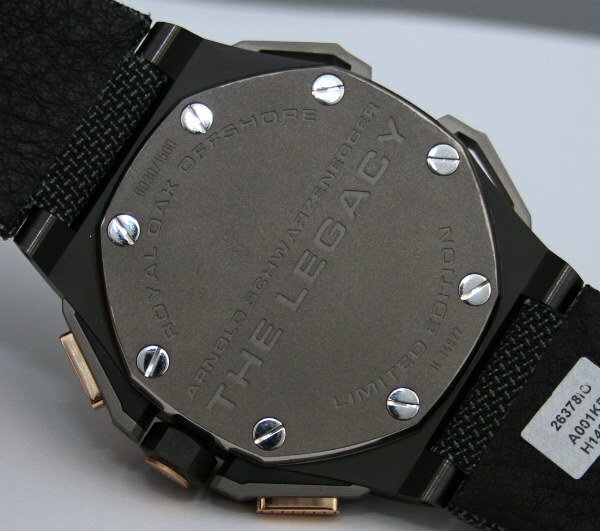 It goes deeper… To celebrate the man-watch love Audemars and Arnold shared, AP will release a new limited edition of 1,500 watch set called “The Legacy.” As I mentioned, the full name of the watch will be the Audemars Piguet Royal Oak Offshore Arnold Schwarzenegger The Legacy watch – and it is a beautiful thing. It is also rather massive at 48mm wide. The Legacy actually represents three important things from a design perspective. I will get to that in a moment. I did want to mention that the proceeds of each of the 1,500 watches (profit after costs) will go to Arnold’s “After School All-Stars” charity foundation. 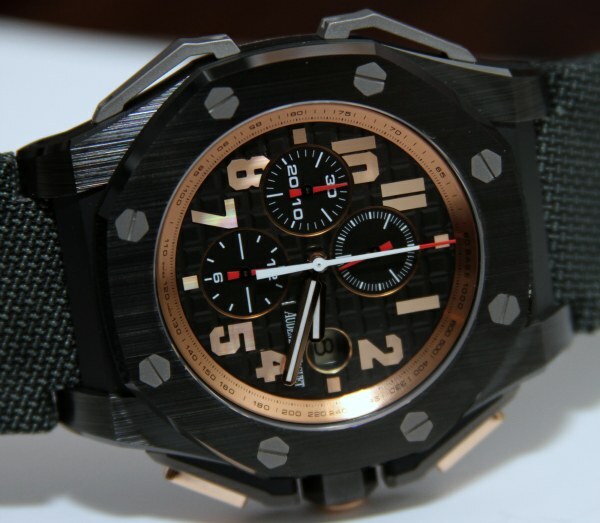 The first thing the watch represents are design cues from each of the previous AP for Arnold watches. What comes to mind first are the hour indicators, side treatments, and of course the size. 2011 is really about design subduction and certain key materials. AP lead designer Octavio Garcia kept his promise to me that 2011 would see wild design take a back seat to more simple, timeless designs. We wasn’t kidding. 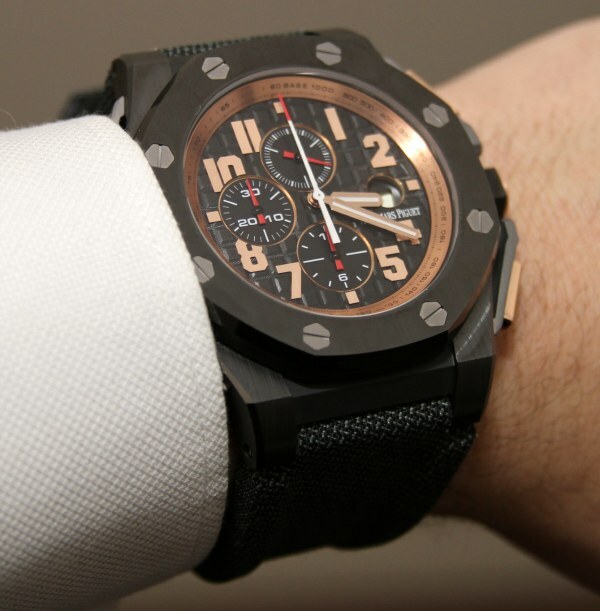 2011 was like a 180 degree turn from the famous Royal Oak Offshore Grand Prix watch from 2010. As such, the designs focus more on key lines and features, and less about wild details. It is an interesting look, and I think they feel right for the times. 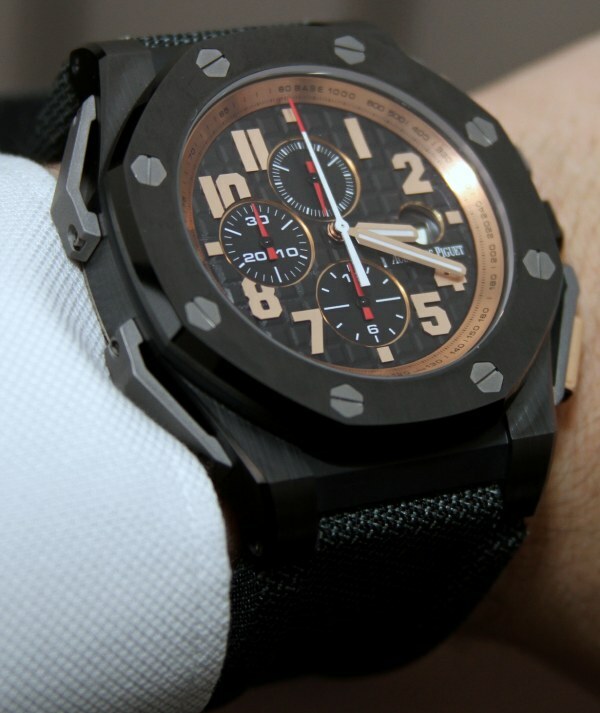 AP is still able to have the watches look very much Royal Oak Offshore, and also still look totally modern. As for materials, The Legacy contains those materials the brand is most serious about this year. Those are ceramic, titanium, and gold. 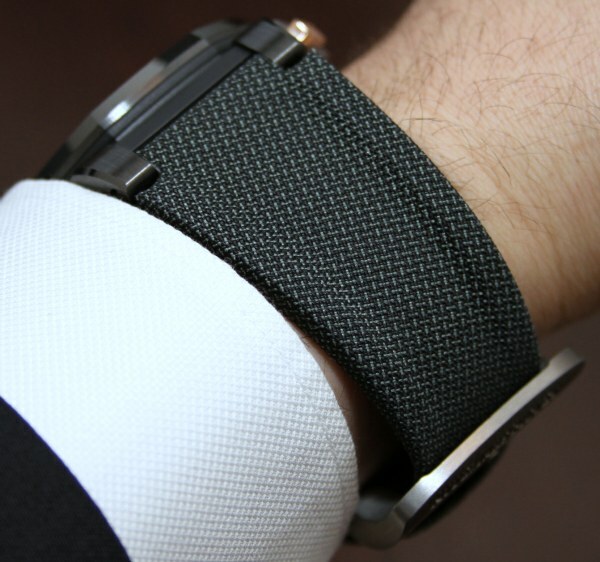 I don’t care what AP says, this watch is bigger than 48mm wide. But that is the official number. Just look at it on my wrist (officially with the implements the case is closer to 55mm wide). The case is also very long from lug to lug. What I love is that the case is made from black ceramic. The ceramic has been finished using some fancy techniques to give it delicately brushed and polished surfaces. The bezel is also ceramic, with elements of titanium screwed on to the side of the case, and used for the caseback, and screws. Last, there is rose gold use for the pushers and part of the crown, as well as for the hour indicators on the dial and the hands. Oh, and the majority of the crown is ceramic. The watch looks awesome, and the detailing is superb. Some of the details are neat. One of them is the use of the mega tappiserie texture on the chronograph pusher as well as the dial. I also really like the diamond polishing of the surface of the gold Arabic numeral hour indicators that give them a rainbow color shine. Hints of red on the dial mix with all the colors nicely. 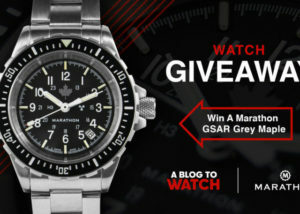 This feels like a luxury military watch in essence. The watch mixes black, great, gold, green, and red together. The green is subtle, and is mixed with black and gray. You’ll find it on the fabric strap that I am told is Kevlar. Don’t quote me on this or trying anything funny, but the strap might actually be bullet proof. 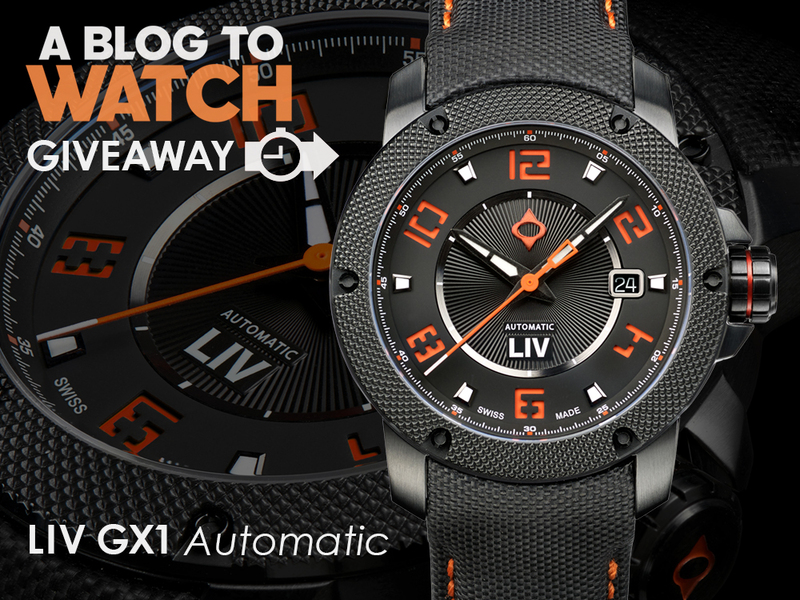 This massive watch is massive cool – and I think you’ll like it as much as Schwarzenegger. I know he is excited to get his. Inside the watch is an AP calibre 2326/2840 automatic chronograph movement. Each of the 1,500 pieces will be priced at $40,200. Big money, big watch. I want one in a big way. Is it just me, or does the dial to case/bezel ratio seem different than other ROO models? Maybe it’s the colour combos, etc, but the dial looks too small inside the massive case. The detailling is incredible, but the palette used is horrible (for me). I’m no fan of (yellow) gold tones, or red, so I find myself hoping it comes in a few choices, although I doubt it does. Who wants to start a pool to see how long before someone tests the bullet proof theory? I have to say that I am surprised, when I saw the name ‘Arnold Schwarzenegger’ I wasn’t expecting this. I like the dial and strap, but the case finishing really does it for me. I would never spent 40,000, but then again I am no terminator. Nice addition to the ROO family, however I have never been able to “learn to love” this type strap. It looks tough which is cool, but I haven’t ever seen a watch that really goes well with this attachment. This ROO looks refreshingly good compared to quite a few ROOs of questionable aesthetics. Really, the only thing I’d done differently (not that AP is looking for my opinion) is remove the date (maybe put AP logo in there instead).